Managing organizations today is more challenging than it was in the past. A major part of the reasons for this is that employees are becoming more aware of their rights and interests in employment. Being a world class metropolitan, the keystone of Hong Kong`s success relies very much on its well-established legal & tax systems which provide trustworthy foundations for business and management. The Advanced Diploma in Employment Ordinance and Taxation helps you understand the three essential areas in managing your employees and organizations. These include the Employment Related Law of HKSAR, the Tax Systems in Hong Kong and PRC and the Negotiation/Mediation Skills. The course will provide necessary skills and knowledge to participants so that they can manage the relevant issues with confidence. 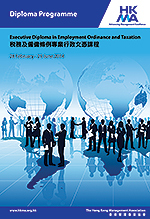 There are frequent changes in laws relating employment and tax system these days. Managers and professionals of different organizations must furnish themselves with adequate knowledge so that they can tackle complex issues arising from relevant situations. Also, as employees become more demanding and outspoken, proficient negotiation/mediation skills is a must to resolve disputes in the workplace. Chinese Course Manuals will be in English. The programme commences in May and November each year, and the application deadline is one week prior to the commencement date.